Before determining the best roulette bets every player should formulate his/her tactics, what he/she wants: to maximize his/her winnings, to stay as much longer in the game as possible. But it is almost impossible to be in the game for a long time. 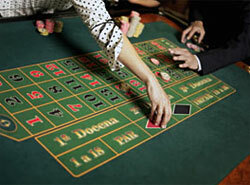 There is a big range of roulette bets. And there are 2 groups of them: inside and outside bets. Straight bet (classic bet) - you bet on one number. The payoff is 35 to 1. Split bet, or a two-number bet - you place a bet on the line, which separates two numbers. The payoff in this case is 17 to 1. Street bet, a three-number or a stream bet - you bet that one of three numbers will win. The payoff is 11 to 1. Square bet, or a 4-number bet - you bet, that one of four numbers will win. The payoff is 8 to 1. A five-number bet - you bet that one of the following numbers will win: 0, 00, 1, 2, 3, and the payoff will be 6 to 1. It is not a very desirable bet because it isn't profitable enough. The outside roulette bets are placed outside the grid. Red - you bet on a red sector. The payoff is 1 to 1. Black - you bet on a black sector. The payoff is 1 to 1. Odd - you bet that the odd number will win. And the payoff will be 1 to 1. Even - you bet that the next winning number will be even. The payoff is 1 to 1. High bet - you bet that one number from 19 to 36 will win. The payoff is even (1 to 1). Low bet - you bet that one number from 1 to 18 will win. The payoff is even (1 to 1). Dozen bet - betting that one of dozen numbers will win (1-12, 2-24, 25-36). The payoff is 2 to 1. Column bet - you bet on one number of the column. There is a top, bottom and middle column. The payouts are different in American and European roulette. European roulette has a single zero and American roulette has a double zero. It influences the payouts. In American roulette it will be 94.7% and in European - 97.3%. With inside bets the players can win more, but lose more often. The opposite situation is with the outside bets. In this case, you can win not so much. So, the range of bets is large and everyone can choose the corresponding tactics.